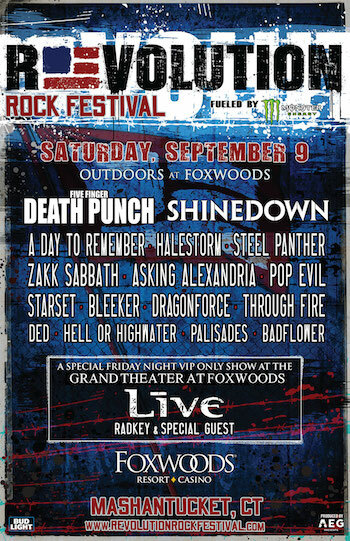 After an incredible inaugural year that drew 15,000 fans, Revolution Rock Festival, fueled by Monster Energy, returns Saturday, September 9 with Five Finger Death Punch, Shinedown, A Day To Remember, Halestorm, Steel Panther and more outdoors at Foxwoods Resort Casino in Mashantucket, CT. New in 2017, fans who purchase VIP tickets or hotel packages will be treated to an exclusive night of music Friday, September 8 at the Grand Theater at Foxwoods Resort Casino with the newly-reformed Live along with special guests. "Last year's festival was tremendously successful as we established ourselves as New England's rock festival. We had fans from more than ten states throughout the region experience all that the Revolution Rock Festival has to offer," said Joe Litvag, Executive Producer of Revolution Rock Festival for AEG Presents. "It's an incredible way to experience some fantastic music while enjoying the amenities of a premium property like Foxwoods Resort Casino." "We were thrilled to host the first-ever outdoor music festival held in Southeastern Connecticut, and we look forward to growing upon the success of last year's sold out event," said Felix Rappaport, President and CEO of Foxwoods Resort Casino. "As the premier resort destination in the Northeast, we will continue to provide our loyal guests with world-class entertainment as only Foxwoods can offer." "The boys and I have a saying in Shinedown. We don't get all dressed up for nothing!!! We are so privileged to be on such an awesome lineup. Connecticut, LET'S GET IT ON," said Brent Smith of Shinedown. Revolution Rock Festival is supported by our rockin' sponsors: Monster Energy and Bud Light. These partners, along with many others, will feature interactive experiences, artist meet & greets, and other unique fan engagement opportunities throughout the festival. 25 Years Proud. Since 1992, Foxwoods Resort Casino has offered guests The Wonder Of It All as the premier resort destination in the Northeast. As the largest resort casino in North America, Foxwoods offers a vast array of gaming in seven casinos; AAA Four-Diamond hotels, restaurants from gourmet to quick service, world-renowned spas, award-winning golf, state-of-the-art theaters, and exclusive retailers. Foxwoods is owned and operated by the Mashantucket Pequot Tribal Nation and was the first full-service casino built on tribal land, pioneering a nationwide movement that now includes more than 400 gaming properties owned and operated by over 200 tribes across the U.S. For more information on Foxwoods and the property's 25th anniversary celebrations, visit foxwoods.com.